Modern theory of rent does not confine itself to the determination of the reward of only land 8.” a factor of production. 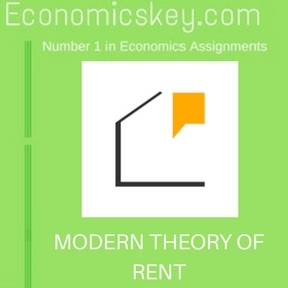 Rent according to the modern sense can arise in respect of any factor of production. It is a surplus payment in excess of transfer earnings of that factor. We have already explained that transfer earnings means the amount of money which any particular unit of a factor could earn in its next best alternative use . Economic rent of a factor of production is the excess over its transfer earnings. i.e, what a factor may be earning in its present employment over what it could earn in its next best employment other owners. transfer earnings of a factor mean who a can earn in its next best alternative use, occupation or industry. We can also define transfer Cat nings as the minimum earnings which a unit of factor of production must be paid in order to induce it to stay in its present use or industry or occupation. If a factor is getting less than this minimum, it will give up its present employment and shift to it next best alternative employment. But if a factor in its present employment is earning more than the minimum necessary to keep it in that employment, the excess is called economic rent. This concept of rent is applicable not merely to land but to all.factors of production. That is, labour, capital and entrepreneurs too ,·,n earn economic rent in this sense. Let u give some examples to explain this concept. Suppose, a lecturer in economics is getting Rs. 600 per month as salary. Suppose, further that his next best employment can be in a bank where he can get Rs. 500. If he cannot get Rs. 500 in a college, he will take up a job in a bank and earn that much. But since he is actually getting Rs, 600 as a lecturer in a college, he is earning Rs. 100 IONIC than his next best alternative employment ‘That is, be is earning Rs. 100 as economic rent. Take another example. Suppose, a piece of land is devoted to the cultivation of cane in which the owner of land is earning Rs. 1,500. If in the next alternative use, say cultivation of cotton, it can fetch Rs. 1,200, then in its present use it is earning Rs. 300 more than its transfer earnings. This excess of Rs. 300 is surplus or economic rent. In the same manner, we can take the example of capital. Suppose, one is getting \0 per cent on a certain investment of capital. Suppose further the next best investment is fixed deposit in a commercial bank where one can get 7 per cent. This means that the present investment gives an excess of 3 per cent over its transfer earnings. This is economic reo From the above analysis it is clear that a unit of factor of production can earn more in its present use than its next best alternative use or the transfer earnings. Economic rent in such a case is the difference between the present earnings and transfer earnings. In Joan Robinson’s words, “The essence of the conception of rent is the conception of a surplus earned by a particular part of a factor of production over and above the minimum earnings necessary to induce it to work”).